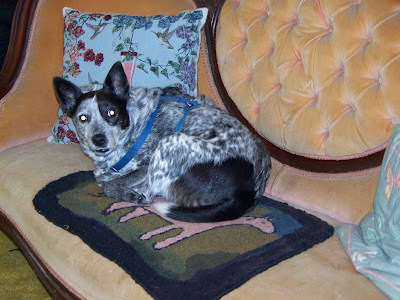 My Dog Blog: Blue - Caught! Haven't had much blog time in recent days. Yesterday, I fell at the farm - in the indoor arena, I tripped on an ice stalagmite, formed by drips from a leaky spot in the ceiling. The ice rammed my leg and I guess I'm lucky it didn't break. 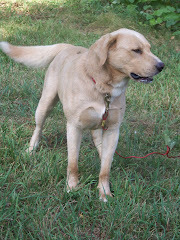 It was one of those painful falls where I had to lay still for several minutes before I could move - and in the process, I learned that George is not a helpful rescue dog (not like my old Rusty) - I yelled at a horse to get away after I fell, and George took off. I didn't want to be walked on by a curious horse, but I could have used George to bark them away for me. Anyway, it was mostly my dignity hurt, I'm fine now. This morning, I was hooking in the dining room, had about an hour of nice peace and quiet before my mother needed any help, and caught Blue making a big mistake. George has proven that he loves to sleep on his hooked rug and I have known that Blue has decided she deserves one, too, but this is the first time she didn't fly away when I caught her. I put the rug on the loveseat to protect it. 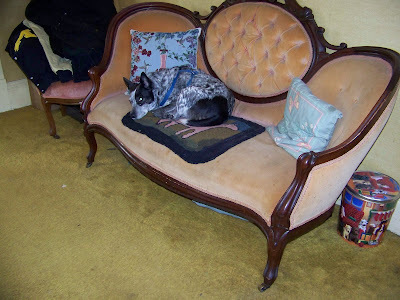 The loveseat was inherited by my mother from her Great Aunt Nell Fillmore. It came from the Fillmore home. Aunt Nell left a matching chair to my grandfather, and when he died my mother was given the chair. This loveseat and the chair have been two of my mother's most important possessions. Aunt Nell was an artist who travelled to Germany to attend art school back in the 1890s. Mother has two of her paintings which will someday be mine. 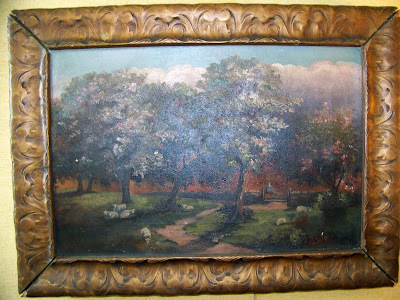 My oldest brother had one of them, a wonderful pastoral scene, but let his kids knock it off the wall and damage the frame and then got rid of it when his wife was given some "collectible" prints - I am so glad my brother is color blind and had no appreciation for this wonderful painting. Anyway, I caught Blue on the loveseat and I'm really glad Mother didn't see her. I think Blue is getting a little senile and doing things without thinking about the consequences. We've always been told that you can't teach an old dog new tricks and maybe it's also true that you can't get them to remember their old tricks.